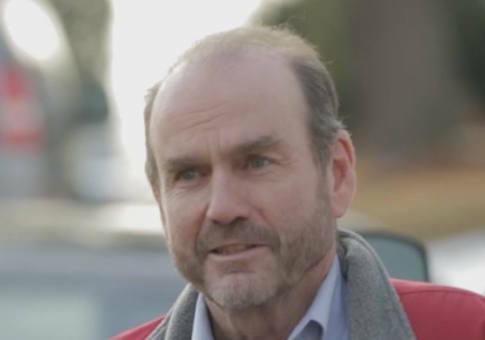 Democratic congressional candidate Scott Wallace's taxes suggest he was out of the country for more than two years while receiving tax credits in Maryland that require residency in the state for at least six months out of the year. Wallace, a wealthy progressive philanthropist, is challenging first-term Republican Rep. Brian Fitzpatrick in Pennsylvania's 1st Congressional District. Before moving back to the district to run for office, Wallace spent time in Maryland and South Africa running the Wallace Global Fund, his family's foundation, which has given millions to radical left-wing groups. Wallace was hit with a $70,000 tax lien in Maryland, which the Congressional Leadership Fund, a group backed by House Majority Leader Paul Ryan (R., Wis.), has hammered the Democrat for. Wallace countered the group by releasing an advertisement and his campaign said that he had paid his taxes in full upon seeing his bills. If Wallace paid his tax bills as soon as he saw them, the tax lien levied against the Democratic candidate indicates he was out of the country for at least two straight years prior to returning to the United States. 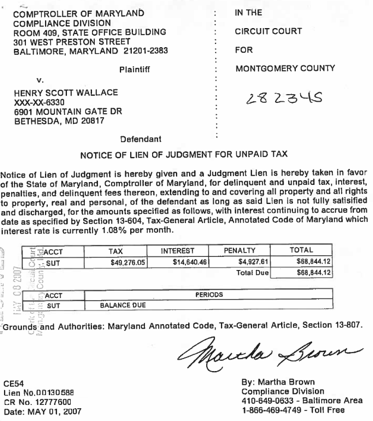 Maryland filed the state tax lien against Wallace in May 2007 totaling $68,844.12. The total amount of the tax lien was for $49,276.05 in unpaid taxes with $14,640.46 in interest and $4,927.61 in penalties, court records show. The interest rate was 1.08 percent per month at the time Wallace was hit with the lien. According to the Comptroller of Maryland's office, tax liens accumulate using simple interest. At this rate, the interest payments would have taken around 27 months to gain the amount of interest that appeared on Wallace's bills before he paid them in full, meaning that if Wallace did pay the bills as soon as he returned to the United States and saw them, the Democratic candidate was out of the country for more than two years. Wallace and his wife bought a home and moved to South Africa in 2005 where they had spent "most" of the following three years, Wallace said in a November 2008 email to John Podesta. However, Wallace also received thousands in homestead and property tax credits between 2005 and 2008 while he appeared to be out of the country, which applies to "owner occupied residential dwellings" defined as the owner's principal residence where they live for at least six months out of the year, according to the Montgomery County, Md., department of finance. "The credit applies only to owner occupied residential dwellings and is based on the total assessment for the land and the dwelling associated with the land," the site states. "The credit does not limit the market value of the property. It is a credit applied against the tax due on the portion of the reassessment exceeding 10% from one year to the next. The credit is based on the 10% limit for purposes of the State property tax, and 10% or less for purposes of local taxation. In other words, the homeowner pays no property tax on the assessment increase which is above the limit. There are certain conditions that must be met for credit eligibility: The dwelling must be the owner's principle residence and the owner must have lived in it for at least six months of the year, including July 1 of the year for which the credit is applicable, unless owner is temporarily unable to do so by reason of illness or need of special care." Between 2005 and 2008, Wallace received $4,775 in Montgomery tax credits including $3,226 in homestead tax credits, records show. Later, in 2014, Wallace said that he had been living in Africa "for the last 10 years." The penalty in Maryland for accepting homestead tax credits while not primarily living in the state at least six months out of the year includes a 10 to 25 percent fine on top of the total balance of credits received. Wallace's campaign did not respond to inquiries by press time on his time spent in South Africa and the tax credits that he received despite indications he was out of the country for a majority of the time during those years. Wallace moved back to Bucks County, Pa., where he was born, in an attempt to win a seat in Congress. Records indicate that Wallace was in Cape Town, South Africa, as recently as May 2017 participating in tennis tournaments at the Kelvin Grove Club, an elite sports and social club. Wallace claimed he last voted in the district he is seeking to represent in 1978, but records previously obtained by the Washington Free Beacon show that the Democratic candidate did not even register in the county until December 2017 and cast his first vote until May 15, the day of his Democratic primary. Wallace has also come under fire for donations made from his family's foundation, the Wallace Global Fund, that have gone to radical left-wing groups, including millions to an organization that pushes for taxing families for "irresponsible breeding" and hundreds of thousands of dollars to groups that promote the boycott, divestment, and sanctions (BDS) campaigns against Israel. This entry was posted in Politics and tagged 2018 Election, Maryland, Scott Wallace. Bookmark the permalink.